As the hours tick away toward Scott Panetti’s scheduled execution a group of conservative leaders is mounting a last-minute effort to urge Texas Gov. 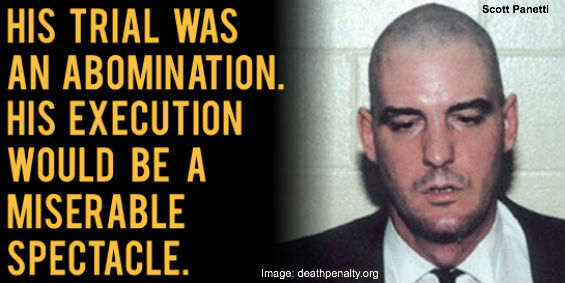 Rick Perry (R) to stop the execution of Panetti, arguing that killing "one of the most seriously mentally ill prisoners on death row in the United States" would "undermine the public's faith in a fair and moral justice system." Panetti has suffered from schizophrenia and other mental illnesses for over 30 years and has been hospitalized on 15 separate occasions. In spite of his illness, Panetti is scheduled to be executed on Wednesday (today) at 6 p.m. CST. Twenty-one conservative leaders have now joined with mental health and death penalty reformers in opposing the execution, asking Perry in a recent letter to commute Panetti's sentence to life in prison, saying, "As conservatives, we must be on guard that such an extraordinary government sanction not be used against a person who is mentally incapable of rational thought." Signatories on the letter include ConservativeHQ.com Chairman Richard A. Viguerie, former Virginia Attorney General Ken Cuccinelli, conservative activist L. Brent Bozell III, former presidential candidate Gary Bauer, former Texas Gov. Mark White and former congressman and presidential candidate Ron Paul. Abby Johnson, an anti-abortion activist, wrote in a recent Dallas Morning News op-ed that opposing Panetti's execution is a pro-life position. "A fundamental tenet of the pro-life ethic is that all life has value and we are called to protect it, especially in its most vulnerable forms. A culture of life recognizes the value of those who are vulnerable and prioritizes safeguarding them," she wrote. "By setting an execution date for Panetti, Texas is going entirely contrary to what we expect in a society that truly values life," Johnson added. "This proposed execution shows a troubling disregard toward the reality of mental illness and protecting those who suffer from it." Unlike in other states, Perry can't single-handedly reduce Panetti's sentence -- the Texas Board of Pardons and Paroles has to first recommend clemency. On Monday, however, the board unanimously voted against delaying Panetti's execution for 180 days and recommending to Perry that his sentence be commuted. According to media reports, Perry's office has not commented on whether the governor agreed with the board's decision, or on whether he was considering a 30-day stay.